When I started visiting crab decks, I’d scan dining rooms to get a feel for the general atmosphere. Then I’d get wrapped up in the menu, the seafood piled on my plate and maybe the TV screen if a decent ballgame was on. Crowd watching was often a hoot, because you never know what quirky characters might get washed in with the tide. But, with hundreds of crab deck trips under my belt, I’ve refined my gaze and now set my sites on items that really show a place’s personality — stuff that’s hung on the walls. I’m not talking about window treatments or paint color choices. I mean the personal artifacts that people nail up for the world to see. It’s the best litmus test for who’s not taking life too seriously and where you’re likely to have fun. Lots of eateries mount regulation nautical items, such as fish nets, crab pots, light houses, ships, anchors, blue herons and vintage photos of watermen. They’re charming and underscore wonderful Bay traditions. But I sit up a little straighter in my bar stool when I notice visual play with crabs. Millions of realistic cooked and uncooked plastic crabs cover walls around the Bay. Yet I yearn to see depictions of steamed crabs doing the unexpected — playing the saxophone, wearing a pirate hat and eye patch, straddling a Harley, waving a frosty beer mug, or hanging 10 on a surf board. The possibilities for animated crabs seem endless. One place paints NFL team logos on real crab shells and hangs them in the playoff bracket positions. That tells me they mean business when it comes to seafood and football. 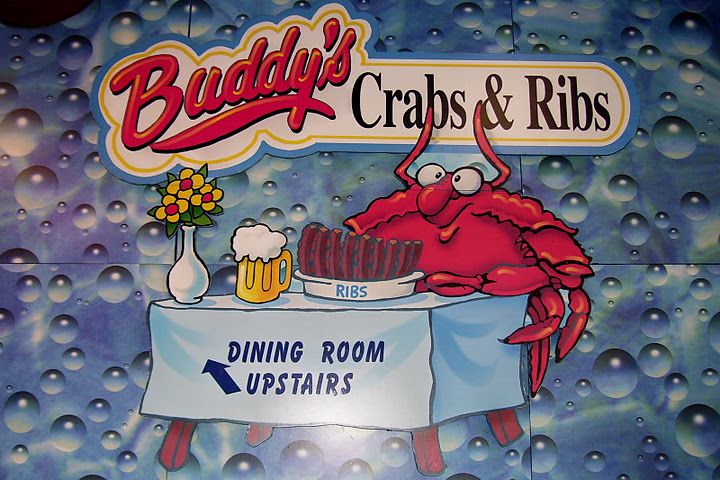 On another restaurant’s wall, a polite crab sits at a white-linen table patiently waiting for his dinner companion to share a rack of ribs. I almost expect to see an oyster Rockefeller wearing a top hat and monocle pull up a chair beside him. 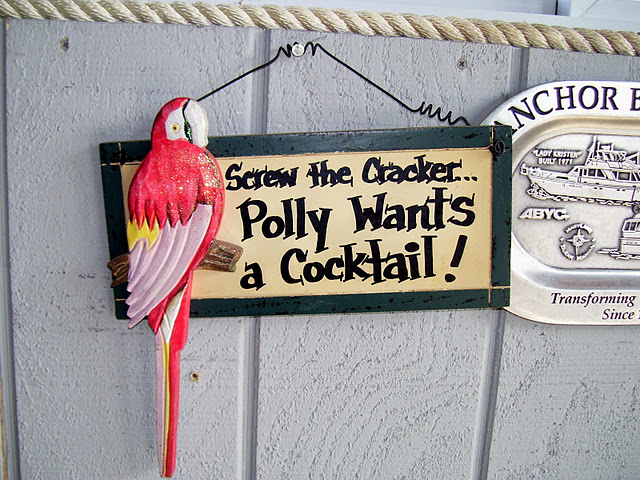 Birds are also a source of personal statements at crab decks. While I appreciate the craft of duck decoy carving, I’m always a bit wary of the come-hither look in their eyes that lures innocent mallards to their demise. Some folks use their restaurant walls to express a disregard for seagulls. After watching the mid-air ninja moves to grab French fries off my plate, I understand why people portray seagulls with a tad of disrespect by posing them with a captain’s hat on their head or a corn-cob pipe clenched in their beak. By far, my favorite room accent was a 2-foot long plastic baby doll’s leg I saw dangling from a rafter. The owner admitted that it washed ashore after a storm, and patrons grew fond of the artificial limb. For holidays and special events, they slip on a fresh clean sock to commemorate the occasion and add a splash of color to the festive décor. 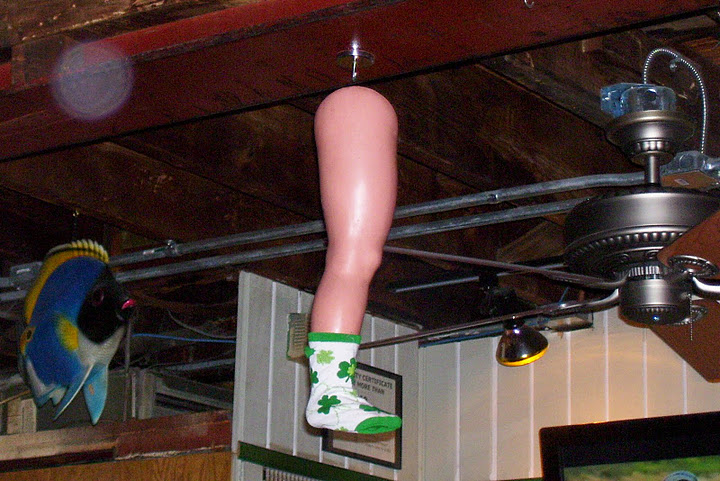 That doll’s leg might be hard to beat, but I’d like to hear about your favorite item you’ve seen hung up at a Chesapeake crab house. Feel free to send photos and comments to susan@crabdecksandtikibars.com.